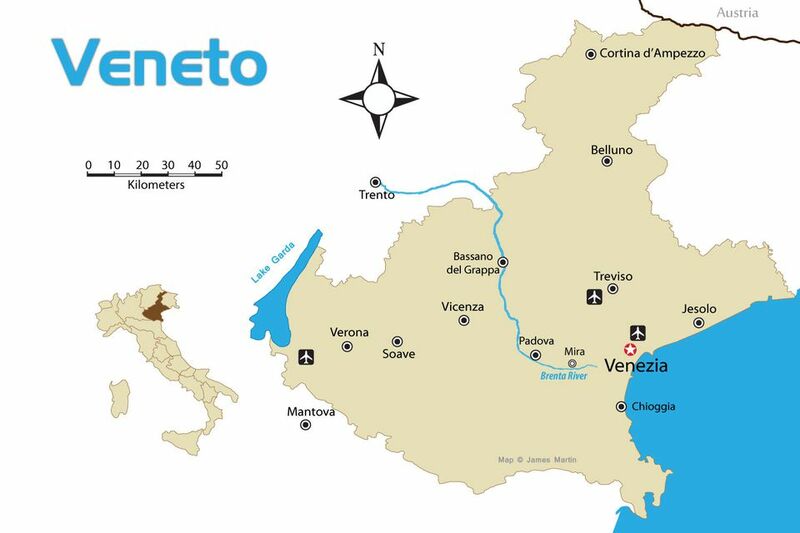 The Veneto is a gem of a region in the northeast corner of Italy. Bound on the west by Lake Garda, on the north by the Dolomite Mountains and on the east by the Adriatic Sea, the landscape of the Veneto is rich and varied. From the grandeur of crumbly old Venice to the medieval flavor of Bassano del Grappa, and on to Belluno, a striking town that's a gateway for visiting the Dolomites, the Veneto makes a fascinating region to explore. The major towns of the Veneto are historic and well worth a visit. Venice is one of Italy's most visited and most unique cities. Saint Mark's Square and Cathedral and the Grand Canal are the top sights in Venice but there are many monuments, canals, and squares worth seeing. A week is not enough, although most folks go for a shorter time. Padua, or Padova in Italian, is one of our favorite small cities to visit, and it's close enough to Venice to make day trips there. Between Venice and Padua is the Riviera del Brenta, where lots of rich folks congregated in the 16th through 18th centuries to build opulent summer residences along the Brenta river: The Venetian Villas. Vicenza was the hometown of the famous Renaissance architect Palladio and 23 of the city's buildings were designed by him, including Palazzo Barbaran da Porto that houses the Palladio museum. Verona, you know from Romeo and Juliet, and most folks make a pilgrimage there if only to rub Juliet's right breast and see the famous balcony, but there's lots more to see including a Roman arena that's used for outdoor opera performances and a beautiful medieval center. Soave is a small wine town enclosed by medieval walls that rise up a hill to a castle at the top. You'll find places to taste wine in town and nearby. Chioggia, in the Venetian Lagoon to the south of Venice, is a pretty fishing port that's sometimes called Little Venice. Lido di Jesolo is a seaside resort to the north of Venice that's known for its 10-mile long sandy beach and summer nightlife. It runs along the sea and is a fairly new town, with services to accommodate beach-goers. A few miles inland is the small, old town of Jesolo. Treviso is another pretty canal town with a medieval center to the north of Venice. It can be reached by train and there's a small airport served by some budget airlines. Bassano del Grappa, at the foot of Mount Grappa, is a lively medieval town on the Brenta River known for its Alpini Bridge and the production of grappa. Most people who've been there say it's one of the most beautiful places they've been in Europe. Lake Garda is Italy's largest and most visited lake with beaches and clear water in the south, rocky cliffs in the north, and villages and castles in between. The eastern shoreline is in the Veneto region and includes the popular towns of Peschiera del Garda, Bardolino, and Malcesine, from where you can take a cable car up Mount Baldo. Gardaland, a big amusement park, is just east of the lake in Castelnuovo del Garda. 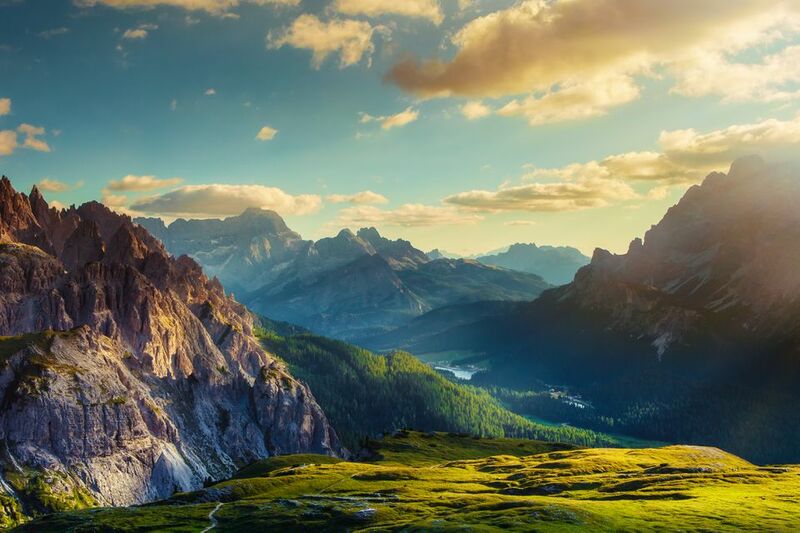 The Dolomites, known for their stunning rocky peaks, make up one of Italy's top mountain ranges and are one of Northern Italy's UNESCO World Heritage Sites. In the winter, the mountains are a great place for skiing and winter sports while in summer you can bike and hike. Belluno, the gateway to the Dolomites, is a city you can enjoy on its own or use as a base to head out on a mountain bike, by foot, or in a hot-air balloon to see the incredible mountain landscapes. Cortina d'Ampezzo is perhaps the most famous mountain resort destination, called the "Queen of the Dolomites." In summer, it's a dream mountain-climbing destination as well. The Cortina Adrenaline Center will supply you with all you will need to get the adrenaline flowing.